Gentlemen: I observe by the Washington Herald that the nine-year-old daughter of Thomas Hayes … was seriously injured yesterday by a bulldog … It seems to me that this is becoming such a frequent occurrence that our government should take immediate steps to rid the city of this particular breed of dog. If you will remember, it was only a few months ago that a child was almost torn to pieces by one of these dogs on Columbia road, and in that case also it was the pet dog of a household. I might add that the muzzle law does not protect children from the attacks of bulldogs, for the reason that they always make the attack on the their master’s own family, or within the home or yard where they are not required to be muzzled. It seems to me that the bulldog is more dangerous than the lion or tiger, for the reason that we protect ourselves against such animals, but there is no protection for the helpless child against this treacherous beast. I trust that this object lesson will make the same impression upon you, gentlemen, as the killing of the little girl did the other day with the motorcycle carrying two passengers, which you promptly investigated and passed a rule prohibiting. I hope now that you will take the same fearless steps and banish all the bulldogs from the District of Columbia. I again wish to state that it seems to me criminal negligence on the part of our government to allow these dogs to remain in our District another day. 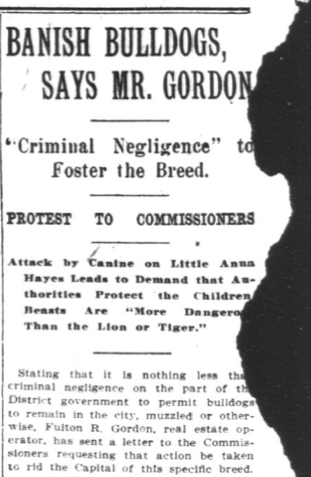 This entry was posted in Mile Stones and tagged 1911, bulldog, district of columbia, pit bull ban, public sentiment. Bookmark the permalink.